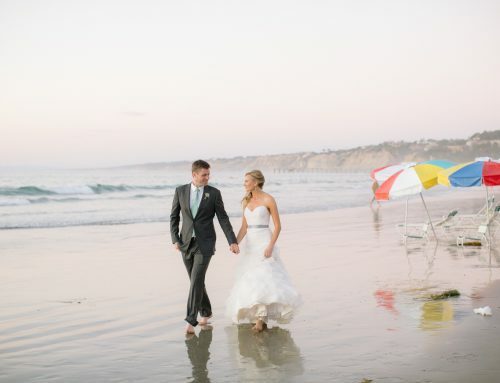 Melissa and Eric’s indescribable Scripps Seaside Forum wedding was held in beautiful La Jolla, California last July. They were incredible to work with, and I can honestly say, I have never ever been so moved by a wedding and a Bride and Groom before. I was brought on for design, full-service planning and coordination, as well as to support them throughout the entire planning process. Their wedding celebration was centered on the idea of Tall and Small. Melissa, being “Small” and Eric, being “Tall.” This theme was carried out from their adorable Save the Date flip book (can be seen in their video seen at this link: http://vimeo.com/46868562), throughout the entire celebration to their adorable cake where the topper is simply the bride, showing the groom’s long legs. Everywhere you turned, there were special touches of Melissa and Eric. They both have such warm and sunny personalities, and I believe their color palette matched them perfectly. We were inspired by sorbet colors. Specifically, strawberry, watermelon, warm oranges, buttery yellows and neutrals. Both the Bride’s family and I grew succulents for the occasion, and we accented the modern clean decor, with chevron patterned runners and grapewood. Guests were greeted with donut holes and infused drinks such as Rosemary Lemonade. Two of Melissa and Eric’s friends sung during the ceremony, which was officiated by Melissa’s brother. Post ceremony, guests were treated to a show-stopping champagne bar and a beautiful view. In lieu of traditional place cards, paper hearts were pinned to cork boards. In lieu of a guest book, the bride and groom opted for adorable note cards where guests could draw a picture and write a note of well wishes. With a slight nod to the Save The Date, the photobooth was truly unique! Stop action photos printed out tons of pictures, and within minutes a flip book was created. As guests made their way to the reception, we wanted to ensure the canopy remained a focal point. Lounge furniture was placed underneath the stars, and the cake was both displayed and cut underneath the canopy. In addition the the custom cake, Melissa also surprised Eric with a Groom’s cake..a replica of an XBox. A few weeks before the wedding, Melissa tore her Achilles tendon. She was originally told she was okay to deal with the tear after the wedding. However, after getting a second opinion, she was in emergency surgery just days before the wedding. She was on a conference call with me the afternoon of her surgery! 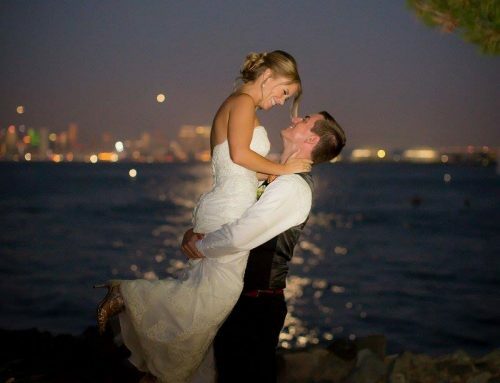 We weren’t sure if she’d be able to walk on her wedding day. While this was occurring, her father’s health began to deteriorate. I was aware that he had Parkinson’s, and that we’d be making special arrangements for him. But, his health took a turn for the worse, and we weren’t sure he’d attend the wedding. Luckily, we made it to wedding day without any further challenges. I coordinated with the groom to carry the bride back down the aisle, and she would be alternating through the day between crutches, a wheelchair and standing single-legged with her hurt leg in a boot. 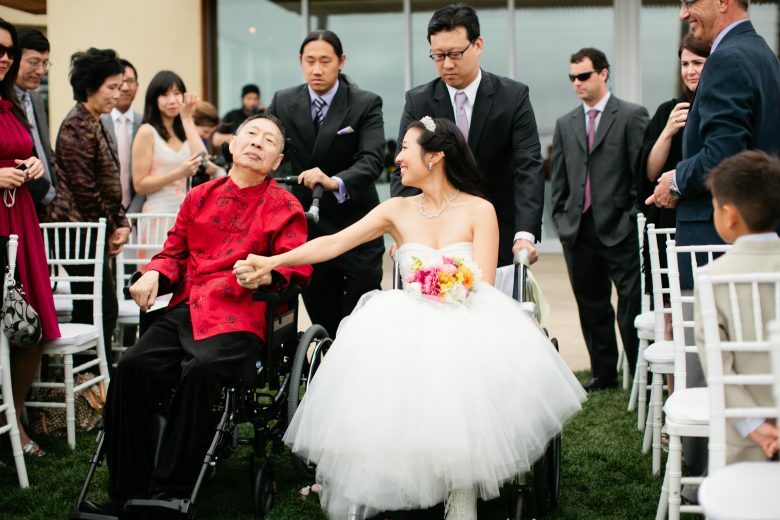 Her father was able to attend, and family members wheeled father and daughter down the aisle in matching wheelchairs. To say that there was not a single dry eye in the house was an understatement. Her father was able to give her away, stay through the ceremony, and was able to join for a few quick photos. I will never forget the feeling I felt collectively seeing Melissa in her decorated wheelchair, with her father at her side. The bride and her family amazed me. Melissa never complained, never wavered and was the epitome of strength. Eric, her groom, was supportive, attentative and simply wonderful. They were able to dance their first dance (I was so thankful that they were “Tall” and “Small!”), do a group dance to the “Wobble” and enjoy the entire day. By the wedding’s end, Melissa father was back in the emergency room. Melissa and Eric went to the hospital instead of their after party. The following morning, a brunch was held at the Marine Room. Melissa’s mother hosted over 80 guests, and I was not sure what to expect when I arrived. Melissa, Eric and their families were smiling, gracious and happy and greeted their guests, as I was on hand to coordinate and design additional florals. Melissa’s father held on till the brunch was over, and the family could return to say their final goodbyes. He passed away in the late afternoon the day after he gave his daughter away. It was horribly sad, but the strength this family showed, Melissa and Eric in particular…was incredible. I am so thankful that I was able to work with this gracious, creative, gregarious couple, and I am thrilled to be sharing their story and beautiful wedding day. Melissa and Eric, you are the best! To see the wedding on Style Me Pretty, please click on this link! body because it had been expertly hidden inside basement of the home, in a very box engrossed in plastic and after that covered with clothes. Peter Sutcliffe, the Yorkshire Ripper, experiences similar care about that of Ted Bundy in that he receives letters from more women every day. Thanks for sharing such beautiful wedding. We all know that it’s important for us to design wedding cards well. We offer a new style of wedding invites with timely and special RSVPs. Hope you love it. Have a try!